Compliance requirements don’t have to bog you down with the right IT partner. Every day Leapfrog helps clients through the trickiest compliance hoops and audits — answering questions, signing attestation letters, or pulling transaction records that prove security and backup preparedness are right where they should be. In fact, everything about how we operate and deliver IT services for our clients is compliance-compatible. Our own SSAE-18, SOC-2, Type II audit clearance puts us well ahead of most industry standards. Whether it’s SEC or FINRA you have to answer to, HIPAA or MU2 you have to prove, or PCI DSS or P2PE on your agenda, we have you covered. Compliance is a constantly evolving game. You’ve got to stay on your toes so you’re ready when the regulators say jump. Together with our independent partners, we can help you set up regular internal audits—starting with a full review of your business practices and how your IT infrastructure’s organized—to ensure your entire enterprise is operating to the highest standards and you’re ready when audits happen. New to compliance – or not, we can help. Maybe you’ve never had to worry about compliance — then suddenly you do because your clients need you to clear the same high standards as they do as a condition of doing business with them. Or maybe you’ve struggled to keep up with regulations for years and now you have to reach full compliance fast. 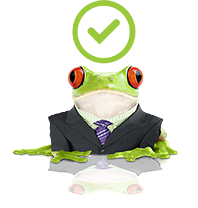 Leapfrog can manage one set of regulations for your or take on your entire compliance strategy. How often do you review your business policies and practices? How do you interact with customers and their data? Which employees have access to critical data, on what devices, and who are they sharing it with? How secure is your IT infrastructure, and who’s managing it? Where and how is your data stored and backed up? In a formal audit, do you have the documentation to prove it? Are you doing internal audits annually? How strong is your security posture? Achieving compliance is one thing, cybersecurity another. Most compliance standards are years behind hackers. You may be jumping through all the right hoops, and still be more exposed than you should be. Leapfrog recommends a thorough and independent analysis on a regular basis to identify your potential risks and vulnerabilities. Once the initial analysis is complete, we’ll work with you to close any gaps and put a management structure in place so audits can be done on an ongoing basis With all the policies, procedures and documentation in place you can to have painless audit experiences – if and whenever they happen.